I had a comment on the last post asking for blank versions of these. I considered just removing the MONTH names, but thought that they might be more useful if I were to make the area for adding text much bigger. I had to cut up (digitally) the menu graphic from The Graphics Fairy and add some thin lines so I could fill the middle with white but it wasn’t a struggle to do so. The issue for me has always been getting as many cards on one sheet as I can. Working in A4, which is about 8.25 inches rather than 8.5 like US letter, is the borders that are naturally left by the printer. I *think* I’ve forced it to work, but anyone who cares to test the PDF on THEIR A4 printer and comment to let me know will be very much appreciated. I printed and measured, and think the will cut to fit PL sleeves. As ever, feel free to comment if you really want the original ones as blanks. That should only take a moment to sort so if the tiny area for text suits your needs, just say…. Hi, and these are so very pretty – thank-you! Mine printed out onto A4 on an HP Photosmart with a top margin of 1 cm, a bottom margin of 5.5 cms and a side margin of 0.5 cms more or less. Just fine! Hello and thank you for this wonderful file. They both printed out great. Just printed this out on A4 cardstock its slightly too narrow but the print out is excellent. I should like to print these out individually and rubber stamp images in the appertures so pretty thank you. I don’t know what would happen if you ticked the FILL THE PAGE box (or whatever your printer calls that) – would it then scale them smaller that 3 x 4? 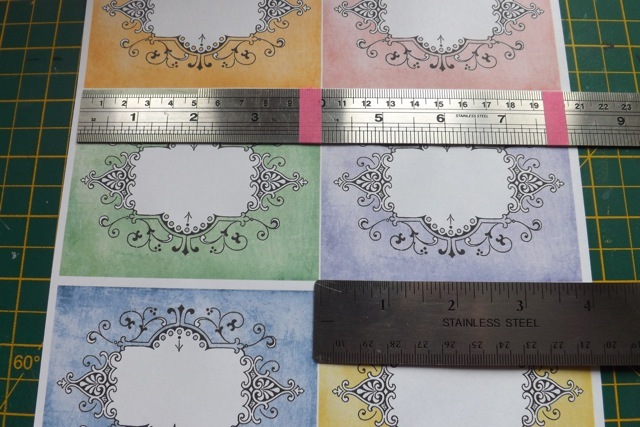 Maybe leaving a thin (like 1/8 inch) white border around the boxes would work – then they would print all the coloured areas, and the white border would be the white margin of the paper. It’s never straightforward when 1000s or printers and people are involved…. I printed it out again (Epson Stylus D92) but this time I made it borderless and ticked the Text/Graphic box instead of the Photo box so the colours werent so dark. Thank you for replying to me! Love this so pretty! Just printed out your lovely journalling cards perfectly on A4 on my HP Photosmart printer. I have never messed about with the margin settings and the top margin was 1.1inch, bottom 2.2 inch and the sides 0.3 inch respectively. They are so pretty. Thank you. Awesome~printed beautifully, thanks for sharing your time and talents with us! Be blessed!